Looking for unique decor for your veterinary clinic or hospital? My original and unique dog art paintings as stretched canvas wall art would be ideal decor for dog lovers and those who appreciate colorful contemporary animal artwork. 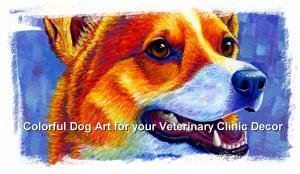 These colorful and vibrant stretched canvas dog portraits are perfect for veterinary clinic decor! They would complement any hospital color scheme, and look great anywhere on your clinic walls. Bring a splash of color to your veterinary clinic's waiting room, reception area, office, exam rooms, and treatment areas. There are many popular breeds to choose from, and more are being added all the time. The energetic and expressive dog portraits will be sure to bring a smile to your clients and staff. These stretched canvas fine art prints come in a variety of sizes to match any room size or budget. They are available as small as 6 x 8 inches, and as large as 46 x 60 inches. They have the option for a glossy or matte finish. The bright bold colors look best in a glossy finish, which also makes the canvas more durable in a veterinary setting, as it is easier to keep clean. There are also four wrap options, which is what goes on the sides of the canvas. My colorful dog art looks best wither with a mirrored gallery wrap, or a black gallery wrap.